Why did Commodity Prices Move Together? Remember the 2008-11 food price spike? It led to food riots in many parts of the world and increased the number of malnourished people by 80 million worldwide (USDA 2009). What many people don’t know about the price spike is that besides the rise in magnitude, it was distinctive for the breadth of commodities affected. Prices of a wide range of commodities including agricultural (wheat, corn, soybeans, cocoa, coffee), energy (crude oil, gasoline), and metals (copper, aluminum), all rose and fell together during this period. It is not unusual for prices of related commodities to move together; if two commodities are either complements or substitutes in production or consumption, then a demand or supply shock in one commodity market may be transmitted to the other. For example, prices of certain industrial metals may move together if they are jointly used to produce alloys. Similarly, prices of grains such as corn, wheat, rice, and barley may move together if they are substitutes in consumption. 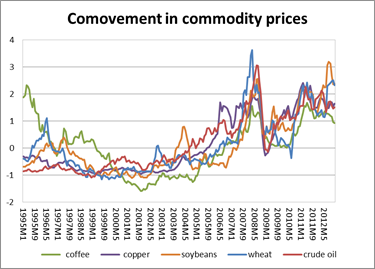 However, commodity-specific shocks cannot explain co-movement of unrelated commodities, like the one observed in 2008-11 (Gilbert 2010, Frankel and Rose 2009). Many of the factors that were initially given as explanations for the price spike—such as drought, or the use of corn and oil-seeds to produce biofuels—are thus unable to explain this rise in comovement between commodity prices. Only factors that can affect many commodity markets simultaneously can be considered as explanations. In a recent paper, I focus on one of these factors, financialization of the commodities futures market, and explore the links between financialization and comovement. The term financialization has been used in the broader literature to loosely describe a range of developments related to the rising dominance of financial markets, institutions, and interests in the U.S. economy since the 1970s. (Epstein and Jayadev 2005, Orhangazi 2008). This concept of financialization has been extended to the commodities futures markets, where financial actors and interests have similarly played an increasingly dominant role in the functioning of the market. Financialization in the commodities futures market refers to the massive inflow of investment in the market, and the rise of commodities as an investment asset. Futures contracts of commodities like oil, wheat, corn, soybeans, etc., are now considered a financial asset like stocks and bonds. The number of open contracts in U.S. exchange-traded commodity derivatives market increased six-fold between 2001 and June 2008, from around 6 million to 37 million in June 2008 (BIS). These new investors are neither producers nor direct consumers of the underlying commodities, and they increasingly control a large share of the market. Between 1995-2001 “bonafide” hedgers, who are producers and consumers of commodities, controlled 70% of the market in crude oil; by 2006-09 they controlled less than 43%. This financialization of commodity futures markets may cause comovement between unrelated commodities in three ways. First, if commodity futures are bought and sold not based on expectations of future demand and supply of the particular commodity, but based on other portfolio considerations or herd behavior. This is especially true for financial traders who buy and sell commodity derivatives not individually, but as a group of securities based on pre-set weights of commodity indices like the Standard and Poor’s-Goldman Sachs commodity index (S&P GSCI). If a large portion of “investment” in the commodities derivatives market are controlled by such passive index trading (like they were in 2008), then it is likely that prices of commodities will move together. Second, if commodity speculators trade in two or more commodity markets, a fall in the price of one commodity may cause the price of other commodity to also fall. For example, if price of commodity A falls, speculators might have to sell commodity B to cover margin calls in the market for commodity A (in which they have a long position), thus leading B to move with A. Finally, as weight of energy commodities like crude oil is high in commodity indices like the S&P GSCI, so shocks (supply or speculative bubbles) in energy markets might be transmitted to other commodity markets, even if there are no changes in the fundamentals of those specific commodities. In my recent Political Economy Research Institute (PERI) working paper, Financialization and the Rise in Comovement of Commodity Prices, I examine whether financialization of the commodity futures market can explain the remarkably synchronized rise and fall of commodity prices in 2008. For the empirical analysis, I extract common factors that explain trends in prices of 41 commodities and study the correlation between this common factor and the flow of money into the futures market. Results show that financialization can explain the rise in comovement between commodity prices after accounting for other macroeconomic variables such as demand from emerging markets and depreciation of the U.S. dollar. These results imply that as financialization of the commodities futures market proceeded and more traders entered the futures market, market liquidity increased. Much of the rise in liquidity was due to increasing investment in commodity indices, which meant that futures of unrelated commodities were being bought and sold together as parts of portfolios. This increase in liquidity across different commodity markets led to the synchronized rise (and fall) in commodity prices. This growing influence of high finance on commodities has several ramifications. Commodities futures markets have existed in the United States since 1865, providing producers and consumers of commodities to hedge against unexpected changes in prices. But, as the futures market is taken over by financial interests and prices become more volatile, it may lose its usefulness for producers and consumers. More importantly, as prices will become more unstable, the financialization of commodities will lead to price spikes like the ones we witnessed in 2008-11. The most vulnerable people in the world will be affected the most because they spend higher proportions of their incomes on food and are unable to smooth their consumption over time. In 2008, a majority of those negatively impacted were members of women-headed households who had limited access to land and other resources. Most of the countries that were affected were poor, food-importing countries that neither had the budgetary means nor the option to restrict exports and shield their populations from high prices. Manisha Pradhananga is Assistant Professor of Economics at Knox College. « China’s Green Jobs—Cause for Celebration?